As of 2016, nearly 80% of millennials are not in the stock market. In 2017, a different study on millennials showed that two thirds don’t own a retirement or regular brokerage account to invest. The same study by Bankrate showed that only 17% of millennials said that the stock market would be their preferred investment. What exactly brings about such fears and skepticism to learn more about publicly traded assets, much less USE their knowledge? It most certainly can’t be a fear brought to them by their parents. Adults in their 20’s and 30’s today, were born during one of the greatest bull markets in the last 100 years – when US stock markets moved over 10 fold in less than 20 years during the 1980’s and 1990’s. Merely glancing at their retirement accounts, and you’ll be able to quickly calculate significant portfolio gains that they would not have been able to achieve if it had not been for having access to the stock markets. Sure, they had to endure the 1987 crash, the 2000 dot com bubble, and 2009 credit crisis, but viewing the markets since the late 1970’s and early 1980’s, stock markets are at all time highs. Any skepticism expressed by the parents of the millennial regarding the accessibility and viability of the stock markets to support family wealth is simply not rooted in reality. It is much more likely, that the millennial is only able to reflect on the challenges that they have seen and known within their lifetime. In the chart above, we show how the average of the largest 30 companies in the United States have been stuck in a long term period of consolidation from 1997 through 2013. That represents the greater proportion of most millennials’ years alive on this Earth. Imagine witnessing or even being part of a catastrophic car accident at a busy intersection. Merely due to the post traumatic stress, you would probably not want to ever drive through that intersection again. Indeed, 1997 through 2013 were comparatively more difficult years to amass profits in the United States stock markets, as investments made during that extended 17-year period essentially netted no gains (per the Dow Jones Index). While the most recent 17 year period is etched rather traumatically in our minds, this period of consolidation can also be viewed in a much broader context – on a considerably longer time period using the data that is available to us. On the longer termed charts, we see that stock markets indeed enter into periods of consolidation – and even long term consolidation. 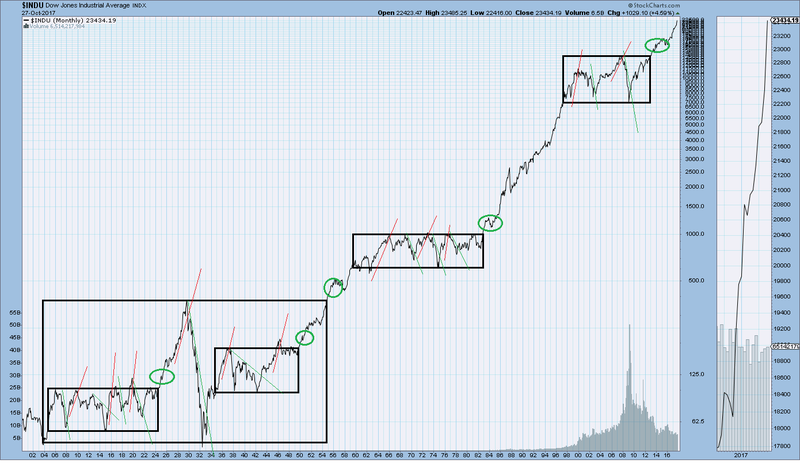 However, over 100+ years of the Dow Jones Index, we see that the Index has moved 370 fold (36,000%). We must admit to the reality that the markets have moved 10 fold in periods of less than 20 years, and 370 fold gains in just over 100 years. And therefore, if it HAS absolutely been factually possible to achieve 370 fold gains in 100+ years, and 10X gains in less than 20 years (eg, during the 1980’s and 1990’s), then surely, anyone who is interested in building wealth or a ‘nest egg’ for retirement should at least LEARN about how to capture gains in such a system. Admitting to the reality that markets move, take the opportunity to LEARN how to capture gains. Some millennials from economically disadvantaged families were born into homes where their parents may not have been avid stock market investors. Possibly despite the 10X gains of the 1980’s and 1990’s, they still did not believe that the stock markets were made for them. Many parents have held on to those beliefs even through today, going so far as to discourage their children from participating in the stock markets. Yes, these publicly traded markets may have been made for “other people” to use, and at one point were completely inaccessible for major proportions of the American demographic. But such barriers to entry have been lowered, and now the markets are accessible to all of us. Don’t allow preconceived notions about how you may or may not be the intended user, prevent you from learning about how to use this instrument to achieve your goals. Markets are always moving. 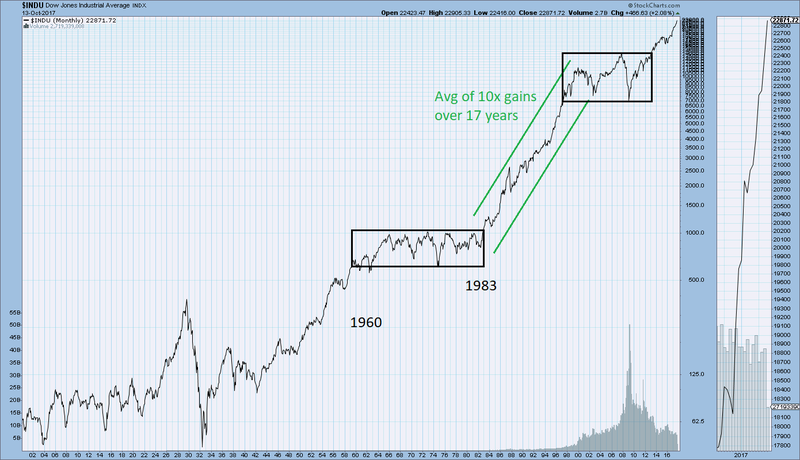 IF a market was to merely repeat a historical pattern and make another 10X gain over the next 17 years – turning every $1 into $10, or $100k into $1M – can you afford to miss out on those potential earnings? If you cannot afford to miss out on a potential repeat of historical movements in major prices, then use pH14 Plan to learn how investors capture real gains from successful investments in the stock markets. Together, let’s find patterns and ‘textbook examples’ of the greatest investments made within a lifetime, and let’s STUDY these exemplar patterns that have allowed people to enjoy their investment returns and experience just a little bit more of what life has to offer.